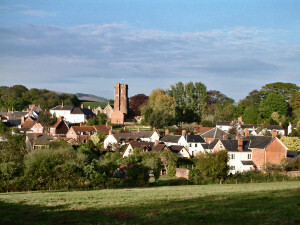 Stogumber is a picturesque but thriving village set in a valley between the Quantock and Brendon Hills in West Somerset. With a population of approximately 600, the main enterprise is agriculture and the village is surrounded by rolling farmland. The Parish comprises the village itself and several hamlets, including Vellow, Capton, Kingswood, Coleford Water and the "Vexfords". The focal point of the village is the Square, which contains the pub shop and St. Mary's Church, a large Norman church with an interesting William Morris style ceiling. The street leading up to the Square, High Street, is the most photographed part of the village, with its mix of colour-washed and thatched properties. The Village Hall and School are situated next to each other and both are a valuable asset to village life. There will be the Annual Parish Meeting in Deane Close Common Room at 7:30pm on Thu 9th May(agenda). There will be an extra-ordinary Parish Council Meeting at Lower Preston Farm, Preston Lane, Stogumber, TA4 3QQ at 6.30pm on Thursday 25th April to discuss a planning application (agenda). We are most grateful to the Community Champions Fund South West and Church Restoration And Stogumber Heritage (C.R.A.S.H.) who have made this Website possible.